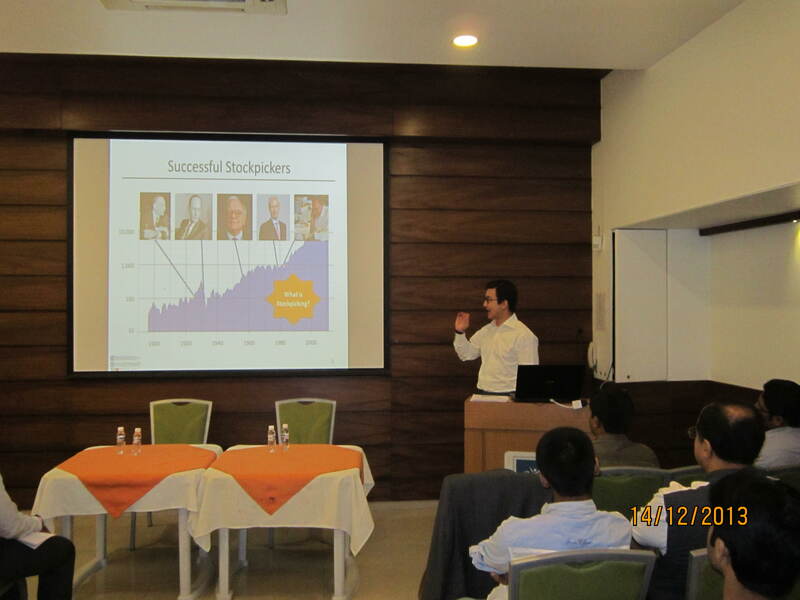 The Pune Chapter of the Indian Association of Investment Professionals (IAIP) had organized a speaker event on the topic of ‘Stock Picking’ on 14th Dec 2013. The speaker at the event was Mr. Adam Rackley, CFA who is a Principal at Research and Investment Toolkit. The talk focused upon the different approaches of stock selection, with the major discussion revolving around the various features of value-based and growth-based styles of investing. Rackley shared insights into the investment methodologies and thought processes of some of the most successful and acclaimed investors in history which included Warren Buffett, Benjamin Graham, Philip Fisher, Seth Klarman and Anthony Bolton. He discussed the importance of defining and following a checklist while making investment decisions and how the individual items of that checklist could vary depending upon whether a value or a growth approach is adopted. Rackley explained the role of behavioral biases in stock-picking and emphasized the relevance of temperament over intelligence quotient for sound investing. The conversation brought out the various factors that limited perfect forecasting, thereby underlining the criticality of maintaining a margin of safety while investing. The speaker also described the concept of the ‘perfect stock’ that was a specific blend of value, growth and quality characteristics based upon the investor’s objectives and preferences. Towards the end, Rackley discussed the BAIT™ Frameworkwhich used a combination of business factors, accounting analysis and investment thesis to enable effective investment decision making. The talk was followed by a candid question and answer session where the pro and cons of top-down versus bottom-up investing, strategies in portfolio building, and the technical and subjective aspects of stock selection were discussed. The two hour long interesting session finally concluded with a networking lunch. This entry was posted in Events, Pune, Speaker Events and tagged Adam Rackley CFA, Anthony Bolton, Benjamin Graham, CFA, Gaurav Aggarwal CFA, Harish Deshpande CFA, IAIP, Jayesh Gandhi CFA, Pune, Seth Klarman, Warren Buffett. Bookmark the permalink.